I had never heard the story of Puss and Boots before. I am suprised my mum never shared it with me, after listening. It is a cute fun story that you and your kids will want to listen to again and again. I also now see where Shrek 2 got it's inspiration. Clive Johnson does a great narration. What I like about his narrations is he talks close to a conversational voice speed, which I find keeps me more engaged and would probably do the same for kids. This is a short and sweet fairy tale about loyalty and brains presented in a charming way. I'm sure kids would love to hear the origin story of the clever Puss in Boots, and the length is perfect for a bedtime story. The narration is well done, with a voice and accent that draws you right in. I requested a copy of the audiobook, and I'm voluntarily leaving a review. 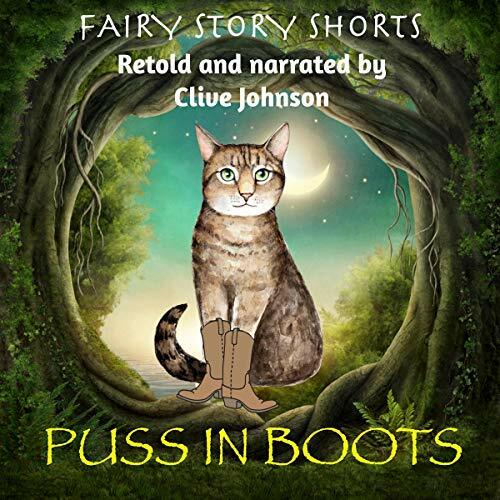 Clive Johnson's version of Puss in Boots retells the classic fairy tale in an engaging, lighthearted way. I enjoyed the clever ruses the cat made to help his humble master and the positive resolution for all involved. If you have a young child this is perfect for bed time or if you are an adult old enough to enjoy a well told fairy tale you are in the right place. Clive's delivery is kindly, gentle and engaging to listen to. Well worth the cheap cost.